You are here: Home / Prematurity / Top Ten: National NICU Nurses’ Day! Top Ten: National NICU Nurses’ Day! Not making that up. Promise. Today is in fact National Neonatal Nurses Day. 2. When Patty, our Nurse Practioner at Seton Main, gave us a hug as Luke was being transported to Dell. That was the best, most understanding, hug I have ever gotten. 3. When Gunther, Luke’s night nurse, told me to sit at Luke’s beside for as long as I wanted and love on him. And, the next day when Bob squeezed my shoulder when Luke was diagnosed with NEC. 4. When we met Nicole for the first time upon arriving at Dell and she took charge, making us feel like Luke was in the best hands in the whole world. Indeed he was. 5. When Lisa announced that Luke’s cords and IV spaghetti were a mess and then promptly color-coded and labeled everything. Oh yes, she and I were buddies. It could also be that she’s an Aggie. 6. When I asked Leah, Luke’s first day nurse at Dell, to be with him during his emergency surgery. I desperately needed someone whom I trusted in that room. If I couldn’t be in there, she was the next best thing. I have no idea if she even wanted to go into that surgery, but she did it so willingly and that gave my heart peace. 7. When I called one afternoon really, really missing Luke and Janet answered the phone. She was holding and loving on Luke. I hung up that phone and cried my eyes out. Our oldest boys had gone to school together and she was our one connection with the outside world that understood our hospital NICU world. Luke was in the perfect hands that day. 8. When Kristy, his primary nurse, showed up on the floor after Luke’s bowel reconnection surgery, to start his IV because PICC had gone home. 9. When I told Dillon that Luke was being discharged and she said, “I’m so happy I could cry.” And then she did. 10. When Thuy gave us our walking papers and told us to get Luke dressed to go HOME. 11. When I called every single morning at 3am while I was up pumping and spoke to Luke’s night nurse, asking for his status report. They were always positive. I’m not sure how many shenanigans he pulled while they were on duty, but I guess that’s their little secret. 12. The many compelling, touching and honest conversations we had with each one of our nurses. Each one. I can honestly say that we only had one nurse that we didn’t love. I think that’s pretty phenomenal. Back off, I know I put 12. Sue me. If any of Luke’s nurses are reading this, I want you to know that what you do changes lives. Well, it changed mine. Every baby that comes through your doors needs you. You’re the ones at the bedside with us moms who are emotional wrecks. You’re the ones who love all over our babies when we can’t be there. You are calm and rational. You stand up for us. Give us advice, yet know when to zip it. You’re also responsible for Luke’s really horrible sleeping schedule. Allowing him to round at 11pm and chart with you at 3am, lulling him to sleep? I know your tricks. This “tree” became very symbolic during Luke’s NICU stay. 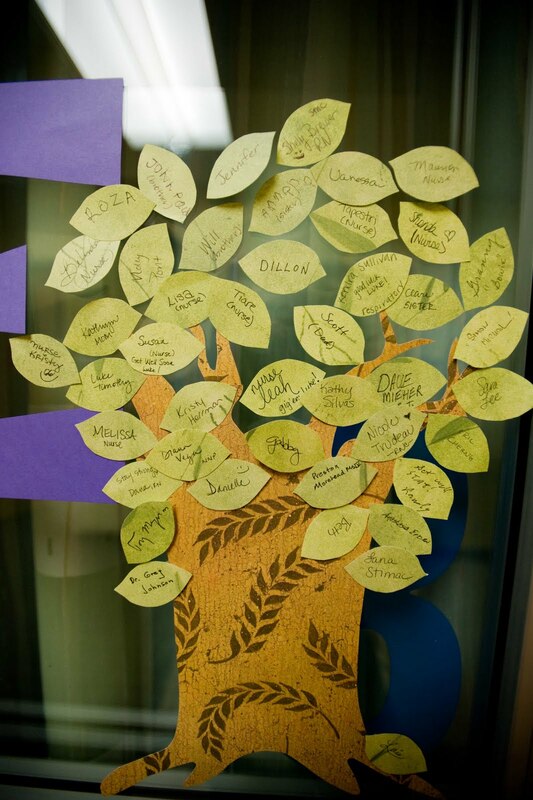 We asked each nurse, clinical assistant, tech, resident and doctor who worked on Luke to add their “leaf.” It is a daily reminder of some very special people. You. Rock. And, a surprise is headed your way later today!